Tesla has spent the last year battling issues with the company’s Model 3 production lines, but beyond that limelight another production issue seems to be lurking. Reuters reports that Tesla’s Buffalo, New York, factory, which is run in partnership with Panasonic, is experiencing severe assembly line issues, especially impacting Tesla’s ability to manufacture solar roof tiles. Reuters’ information comes from eight current and former employees of both Panasonic and Tesla. According to those sources, the aesthetic qualities of the solar roof tiles are among the issues holding up production. Tesla has allegedly been using cells from JA Solar instead of cells from Panasonic, because the JA Solar cells have the preferred level of reflectivity. Panasonic, meanwhile, has been courting offers to sell its cells to other panel makers. Tesla announced in January that solar roof tiles were being produced at the Buffalo factory, also known as Gigafactory 2, or RiverBend, and that nonemployee customers would start receiving the roof tiles that they preordered for $1,000 the year before. 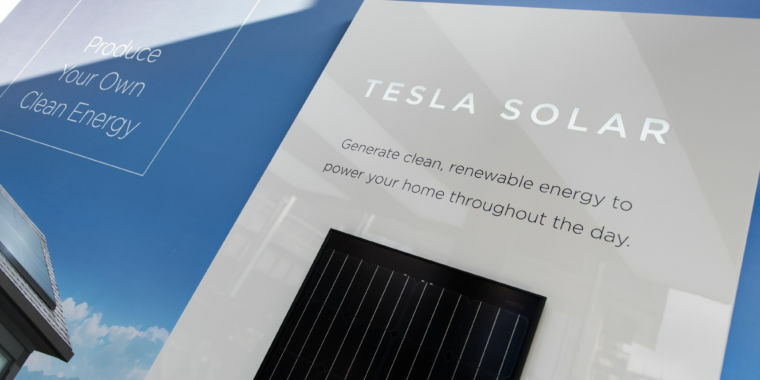 On the company’s quarterly financial call last week, Tesla CEO Elon Musk said that the company had “several hundred” homes with solar roofs on them, but the company later contacted Ars to note that the number included roofs that were merely actively scheduled for installation. Reuters spoke to one solar roof recipient who said he was happy with his roof, but he noted that the installation process took two weeks and a dozen workers to complete. Tesla confirmed the two-week timeline. Reuters wrote that the cost per watt for the installed Californian roofs was about $6 per watt, adding that the price is about double for most solar systems. Although a solar roof combines a roof and a solar system into one (so one would expect it to be more expensive than a traditional panel system), the price underscores the fact that a solar roof may not be a solution for many people interested in solar. According to Reuters, Musk has never visited the Buffalo factory, which officially opened last year. Tesla did not respond when Ars asked for comment on this point. Meanwhile, Tesla’s solar panel business, which it purchased in 2016 from Musk’s cousin, has been contracting. SolarCity saw its share of national residential solar installations shrink in 2017, and the company has closed installation locations while laying off salespeople. Regular solar panels are also manufactured at the Buffalo plant. Panasonic, which operates in the same factory as Tesla, has reportedly been selling solar panels it makes there under its own brand name. Despite Tesla’s assembly line issues, it appears on track to meet its commitments to the state of New York, which gave Tesla $750 million in exchange for promises to hire more than 1,400 people for full-time employment at the Buffalo factory. Tesla also promised to spend $5 billion in the state. Currently, Tesla employs about 600 people in Buffalo.